Got to *love* the woodland theme with the bark vase! I love this combination of amaryllis and magnolia leaves (I'm a Southern girl after all)! 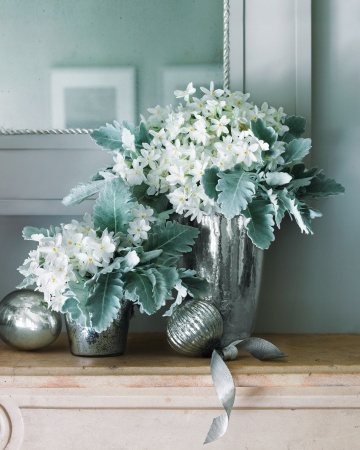 The silver enhances the paper whites and dusty miller leaves. I will post more of our fresh greenery and floral Christmas decor later. I'm waiting because I want it to be fresh for Christmas. Do you like to decorate using fresh greenery? I really wanted to go with fresh greenery this year but alas my allergies kept me from following my heart. I adore that whimsical first pic. so sweet. I would love to, but I lack that skill set! Oh certainly!! I make sure I have a fresh arrangement of greens. I see those pretty images and in all honesty, they remind me of you! I hardly ever decorate with fresh greens, but I would love to. I decided I'm totally getting a couple poinsettias this year. I don't really have the room for them, but I'm going to find room. These are wonderful. 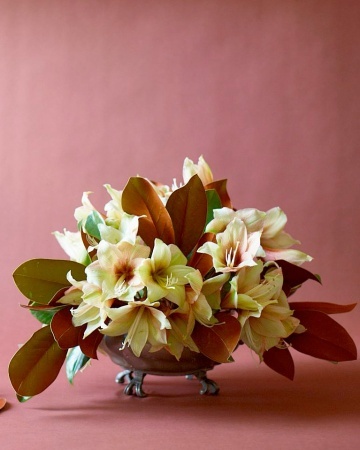 Love the magnolia and amaryllis arrangement! I'm going to buy a fresh wreath this year. I love the way it smells! Sweet hugs! Lovely arrangements. I love how they smell. I miss having a real Christmas tree. Hi Ricki Jill, three beautiful ideas here all equally lovely. Nothing as wonderful at Christmas than fresh fragrant greens and bright floral arrangements. I'm sure whatever you do will be lovely. We decided to go with fresh fir wreathes for the windows this year, left the artificial wreathes in the attic! Hope you have a great weekend. Enjoy the concert..........and Roll Tide!!!!! 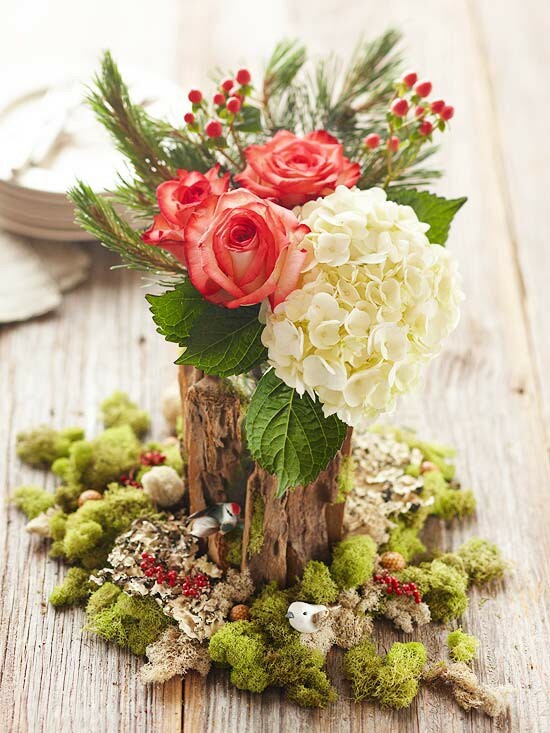 Ricki Jill~ I ADORE the woodland vase, thanks for sharing! I like the silver one - it looks like a winter wonderland. I always go with the red and green traditional decor, but I've always wanted to try a silver and white winter theme. I think it's lovely.